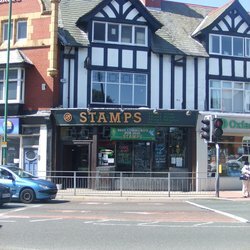 Stamps Bar is based in Crosby Village just 6 miles North of Liverpool City Centre. We opened in 1996 and are now firmly established as one of the leading Real Ale pubs in Merseyside, having won the CAMRA LocALe award in 2010. Since then we have progressed on to opening our own Micro Brewery based up the road from Stamps in Kirkdale. We continue to support other local breweries such as Melwood, Southport and Liverpool Craft to name a few and always try and source beer and food produce from and around the local area. Our slogan at Stamps is “Real Ale, Real Music and Real Food” and we live by this in everything we do here at Stamps. We put on hundreds of Real ales throughout the year promoting what many consider as Real Beer in that it isn’t processed in any way. We have the same attitude when it comes to music and food also, putting on Live bands every Saturday and Sunday and only using fresh, often locally sourced food produce in our kitchen. We are a small bar but we really do care and listen to our customers and many regulars. We introduced our Loyalty card scheme which has proven really popular and which we felt rewarded our regulars for being so “loyal”. Sign up to our weekly news later! Enter your best email address below.